We might not be able to help answer the dreaded question “Are we there yet?” but when it comes to “Does the hotel have a nice pool?” we are here help you score a win right out of the gate! Our experts have compiled the definitive list of the best hotel pools for families in the United States. 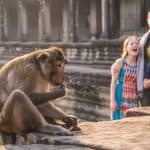 Whether your family is looking for an aquatic adventure or a pure oasis, this list has the best of the best throughout the USA. The Omni Homestead Resort, a National Historic Landmark built in 1766, has long been a favorite of families looking to enjoy the beauty of the Allegheny Mountains and their legendary healing springs. 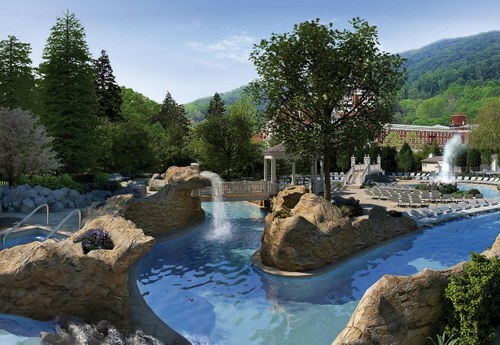 The best hotel pool for families in the mid-Atlantic is Allegheny Springs at The Homestead. It features a children’s pool, family pool, and sandy beach in their two-acre waterpark fed by the local springs. With two 100-foot water slides and 400-foot lazy river, this resort is a pool lover’s favorite destination. During the winter months, the family pool is heated while the children’s pool converts to an ice skating rink. 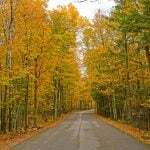 See reviews of the Omni Homestead Resort. LA’s premier resort, Terranea, offers four pools throughout their property! The pool deck features a water slide, splash pad, jacuzzi, and full grill. There is also a 10+ pool, a 21+ pool, and a Spa pool – all with beach front views! Terranea’s location is prime for poolside whale watching. 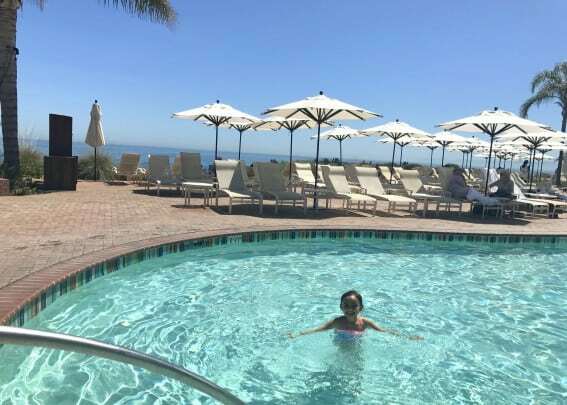 Read rave reviews for Terranea from our families! Several of the best hotel pools for families are in the desert. Those who have visited the Palm Springs area know that resort life tends to revolve around two things, golf and the pool. While Rancho Las Palmas is definitely a top-notch golf destination, the pool complex is also the best in the West. With water slides, a lazy river, a beach area for tots, a splash pad, and a huge pool featuring summer Dive-In movies, this is definitely the place you want to be hanging out during those hot desert days. Read reviews of Rancho Las Palmas from folks who have been there. Those who have visited Scottsdale are aware that resort life here also revolves around golf and the pool, and Westin Kierland gets both of these right in a fabulous, family-friendly fashion. They have an entire team dedicated to fun and they bring it to their pool with games and activities for everyone in the bunch. In between all the organized fun be sure to find time to ride the slides, lounge on a raft in the lazy river, or just splash with your kids in the beach entry pool. 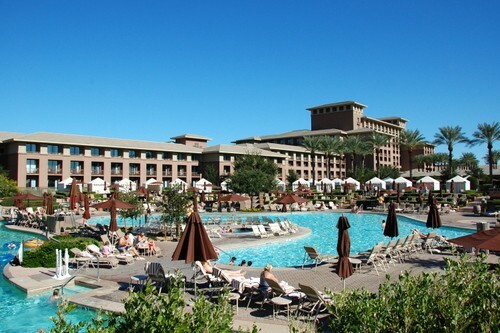 Check out reviews of the Westin Kierland Resort and Spa. With a storied history of five-star luxury, The Broadmoor is Colorado’s queen of hotels. The resort’s large pool is just as enchanting as its surroundings partly because it just seems to flow into neighboring Cheyenne Lake. This illusion is caused by the pools zero entry design and infinity edges which offers unobstructed views of the lake and Cheyenne Mountain beyond. As if all that wasn’t great enough, two waterslides hidden by a “mountain” provide endless entertainment for kids of all ages. When you are ready for a break from the aquatic action, resort employees are happy to set you up with a beach umbrella and a lounge chair on the lawn. Dreaming of the Rockies yet? Check for availabilities at The Broadmoor. 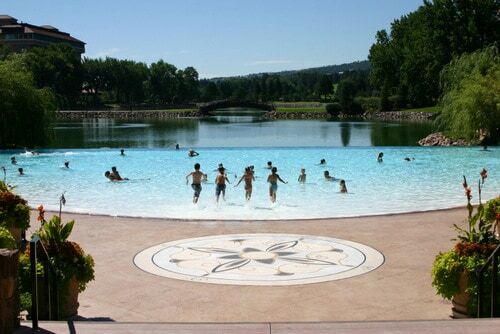 Read family reviews of the Broadmoor Resort. Learn about glamping and traditional luxury at the Broadmoor Resort. 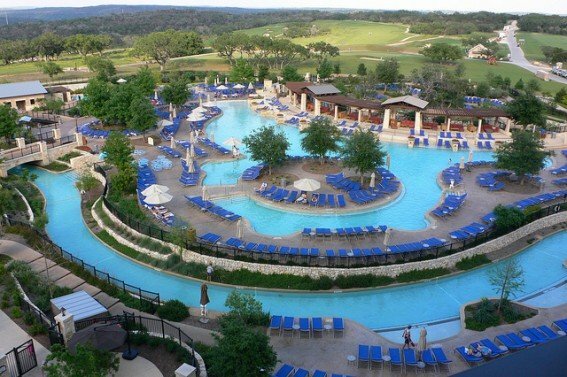 The River Bluff Experience is not to be missed, the JW Marriott San Antonio Hill Country Resort has claimed much notoriety with Texas tourists. The 650-foot rapid river ride, and 1,000-foot lazy river, and 275-foot slide offers excitement to pool lovers everywhere! Throw in the zero depth kiddie splash pad, beach entry pool, and private cabanas – families will experience the southern hospitality in style! Everything is bigger in Texas, so why not our list! With over 1,500 rooms, the Gaylord Texan Resort needed to have an equally huge pool complex. The newly revamped 10-acre pool area, Paradise Springs, is the perfect addition to the resort. The new complex has it all including a 600-foot lazy river, 6,000 square-foot lagoon, a waterslide, and toddler pool. As if all that wasn’t enough, there are also water basketball hoops, a water zip line, and horseshoe-shaped hot pools, a nod to Texas’ western heritage. 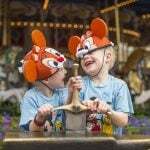 Read Trekaroo member reviews of Gaylord Texan Resort. With real estate at a premium in NYC locating a hotel pool is like striking gold, then you see the view and you realize it more like striking platinum! Le Parker Meridien looks directly into Central Park and a provides a breath-taking night-time view of the Manhattan Skyline. The floor to ceiling glass room will make you feel like you are swimming on top of the world! After trekking through the busiest city in the USA your kids will love some freedom exploring the pool deck while you take in the sunset over NYC! See what other families have to say about Le Parker Meridien. Everything about The Resort at Pelican Hill reflects the luxury of Newport Coast from the guard-gated private villas to the expansive views of the Orange County coastline, to the star treatment that even the tiniest guests receive while staying on site. The opulent Coliseum pool is the largest circular pool in the world at 136 feet in diameter and is lined with more than a million glass mosaic tiles. This pool may seem more like a piece of art than a place to let your kids splash about but fear not, this stunner is meant to be enjoyed. Ready for your own posh California beach vacation? Get the inside scoop on the Resort at Pelican Hill. 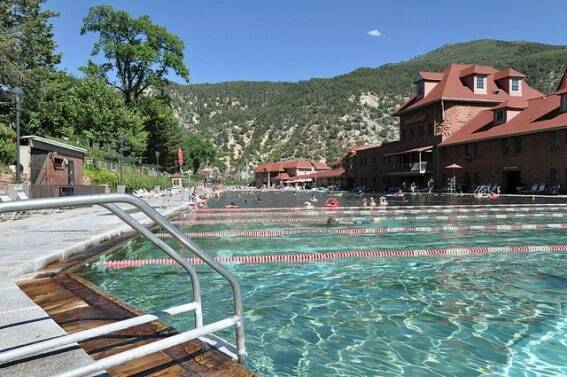 Established in 1888, Glenwood Hot Springs is the largest mineral hot springs pool in the world, spanning two blocks. This Rocky Mountain icon is kept at a warm and cozy 92°F so that even when the snow is falling, the swimming is just fine. As a matter of fact, if you are so inclined you can even embrace your inner polar bear and make snow angels on the deck before warming back up in the soothing mineral waters once again. During the summer months, visitors to this football field length pool can enjoy two water slides, a diving board, and inner tubes. There are several amazing pools in Vegas but the pool at Mandalay Bay still reigns supreme. 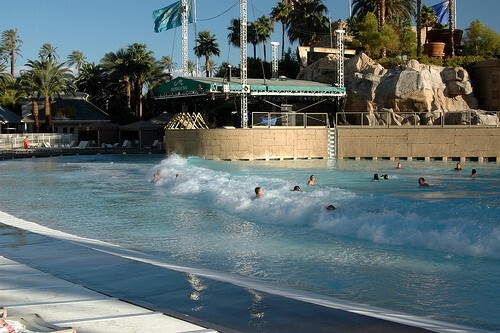 Though I am not sold on Vegas as a family destination, I doubt there is a kid around who wouldn’t love spending a couple of days enjoying the 1.6-million gallon wave pool which crashes into a perfectly manicured sandy beach. The lazy river is nothing to balk at either. Heading to Vegas with kids? Check out reviews of the Mandalay Bay Hotel. Walt Disney World’s newest resort, Disney’s Art of Animation, celebrates the artistry of some of Disney/Pixar’s most beloved films including Cars and Finding Nemo. 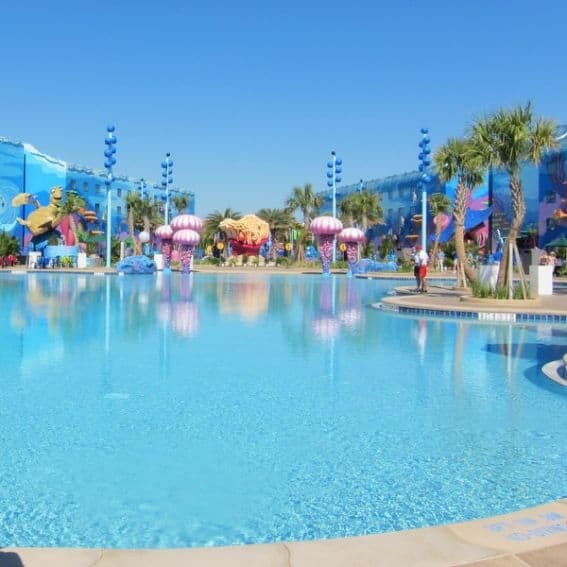 Its main pool, “Big Blue”, is the largest in Disney World history and is surrounded by vibrant larger than life characters from Finding Nemo including Crush the sea turtle and a freshly “inked” Pearl the octopus. The pool features a beach entry, a splash area, and a small aquatic themed playscape. The biggest surprise – guests swimming under the water will be treated to the sounds of Dory and Nemo chattering away under the water, giving imaginative swimmers the feeling that they are swimming alongside their favorite characters in the EAC. There may be another resort out there with more pools but we have yet to come across it! La Quinta Resort Club has 41 swimming pools and 53 spas on the property, making it one cool spot to beat the desert heat. While most of the pools are scattered in courtyards throughout the expansive property, the main pool area is over by the tennis complex and offers a large pool, snack bar, toddler pool, splash pad, and playground. My family’s goal for our next visit – go pool hopping and make a splash in as many as we can! 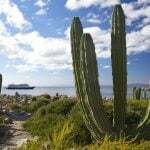 Read full reviews of La Quinta Resort. Many aspects of Disney’s new Aulani Resort on Oahu deserves praise and its expansive pool complex in the heart of the resort’s Waikolohe Valley is certainly one of them. Two water slides start atop the resort’s “lava” outcropping and wind through rock formations. Guests floating along the lazy river will discover fountain springs spouting to life and float through a cavern filled with gurgling water. There is a zero entry pool, two infinity spas, and a quiet pool geared towards adults seeking shelter from the kid-friendly madness. Families with small children will love the Menehune Bridge, a water play structure featuring 3 slides and plenty of opportunities to get drenched. At the Makai Preserve guests can wade in alongside stingrays, starfish, and anemones. Young snorkelers will love Rainbow Reef, the 3,800 square-foot snorkel lagoon teeming with tropical fish because it is a nice introduction to the activity in a sheltered environment. Check out reviews of Aulani, a Disney resort and Spa. Guests love the Grand Hyatt’s multi-tiered pool complex on Kauai’s sunny Poipu Coast so much that they often find themselves never bothering to leave the resort once during their entire vacation. “River pools” wind passed tropical foliage and wild birds while flowing through waterfalls and around green grottos. A 150-foot waterslide splashes down into the active (aka: full of kids) pool while older folks looking for peace escape to the adult pool. Kayaks are available for rent to explore the 1.5-acre sand bottom saltwater lagoon where you can snorkel or just relax with a beverage from the pool complex’s swim up bar. Can’t you hear those island breezes calling your name? See what families think of the Grand Hyatt Kauai Resort. 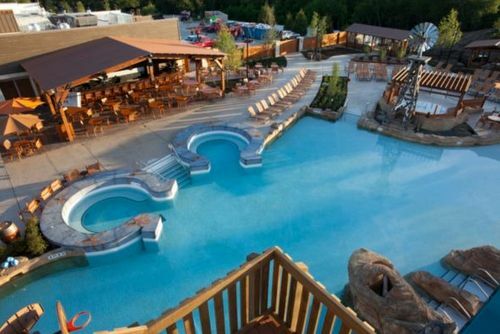 Four pools interconnected with water slides; what’s not to love about that? 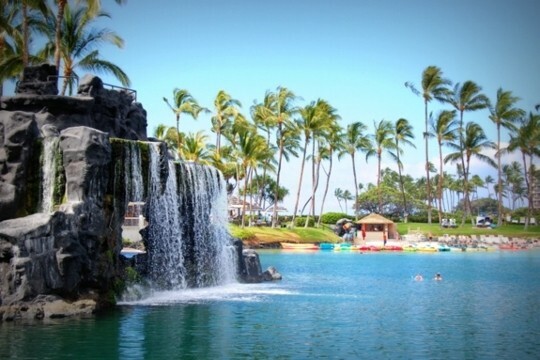 Hilton Waikoloa Village is a Big Island giant that has families returning year after year to enjoy the four pools, along with their lazy river and several other freshwater pools which feature everything from a waterfall to a swim-up bar. Throw in a saltwater lagoon, opportunities to swim with dolphins and sea turtles, and the beauty of the Big Island and it’s no wonder there are so many return customers. 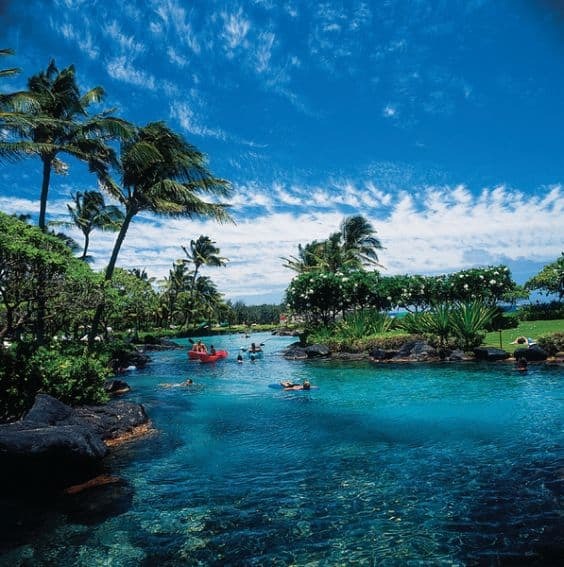 Read reviews of Hilton Waikoloa Village from families that have visited. This pool may very well be the best in America. Set on one of the most beautiful beaches on the planet, the Grand Wailea Resort is one of the most luxurious resorts in the islands. 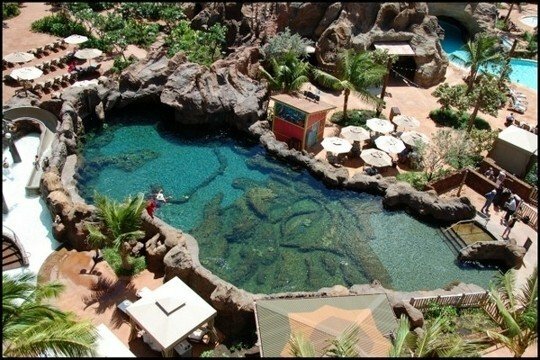 Its massive pool complex, Grand Wailea Canyon, features nine free-form pools on six levels which are connected by a river with varying speeds, from whitewater rapids to typical lazy river currents. There are slides, a rope swing, caves, waterfalls, and even a water elevator. Yes, a water elevator! Those who have experienced this water playground come back with tales of hotel pool zen. Will your family make the journey? Read reviews from those lucky enough to experience the Grand Wailea Resort. Anything good in the Pacific Northwest? Excellent Post. Proper way of blogging with good stuff. 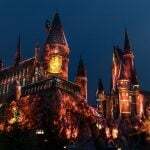 I have book marked your blog for your future posts.